UN Secretary-General Antonio Guterres was, in the annual report on Western Sahara he submitted, on Monday, to the appreciation of the 15 members of the Security Council, more pragmatic, balanced and unbiased, unlike his predecessor, the Korean Ban Ki-Moon. 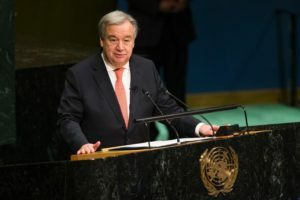 Not only did the UN chief summon the Polisario to “immediately and unconditionally” withdraw its armed elements from the buffer zone of the Guerguarat border crossing point, he demanded that Algeria and Mauritania contribute a little more to the settlement process of the Sahara conflict. Regarding the Guerguarat crisis, the new boss of the UN welcomes the unilateral withdrawal of Morocco from the buffer zone, but expresses disappointment at the Polisario’s refusal to retreat from this zone and urges the Security Council to exact that “the Polisario Front withdraws completely and unconditionally” from the zone. In reiterating the idea of ? ?a mutually acceptable political solution and the need for compromise, Guterres refers exclusively to the post-2006 period and the realism concept introduced in 2008 by the former UN mediator, Peter Van Walsum, who had concluded before the Security Council that “the independence of the Western Sahara was not a realistic option”. “Over the years, the Council has provided guidance that negotiations must take place without preconditions, in good faith, given the efforts made since 2006 and the subsequent developments,” Guterres recalled, indirectly referring to the Moroccan autonomy initiative proposed in 2007. The Guterres report has banned all phrases and wordings so dear to the Algerian regime and the Polisario, such as “non-autonomous territories”, “referendum”, “plundering natural resources”… He has not referred to the interference of the African Union and European justice in the Sahara issue, thus giving the UN the pre-eminence and exclusivity in dealing with this territorial dispute. The end of the era of the Ban Ki-Moon / Christopher Ross tandem and the term of the Portuguese Antonio Guterres at the helm of the United Nations are surely a good omen for Morocco.